Any child is the most special person to a parent in this entire world. The waiting period of nine months for the baby to arrive makes one realize that how much importance it holds in your life even when it is not there yet and of course after it enters into your life the realization of it being your small little world becomes even stronger which is why every parent wants to make sure that there child gets the best care possible. To ensure that they want there child to have the best experience of their life which is why we have got one major portion of your tension released. Andaaz Fashion brings you the best range of ethnic wear for your little hero who would look absolutely handsome and adorable in these looks. We do realize the fact that a child’s skin needs the best care for it which is why the quality of these products have not been compromised at all. The fabric of these outfits is extremely suitable and as soft as baby skin in order to keep your baby away from any sorts of skin allergies, rashes etc. Therefore, the whole clothing line is extremely comfortable and stylish at the same time. Coming down to the Color range and designing, the whole range includes all sorts of bright colors like red, yellow, orange, green, blue, etc to keep your child’s mood lifted throughout the day while the designing is no less either. The styles and designs are inspired by the latest trends spread all over the industry.Festivals and other occasions anyway hold a major significance in our lives which is why we want to look flawless on such special events. In order to make sure that your child looks no less than anyone else you must scan the latest trending collection of baby boy kurta sets and other ethnic wear at Andaaz Fashion. Not only kurta sets, it has got you covered for dhoti kurta, kurta pajama, waist coat, indo western etc which will make your little hero look super adorable and handsome. The vibrant colors and supreme quality will not only make you feel more loved towards your child but you might get reciprocated by your child too when he gets into these delicately handcrafted pieces. Give a new avatar to your baby boy on occasion of any traditional function or cultural program by wearing him an ethnic dress. 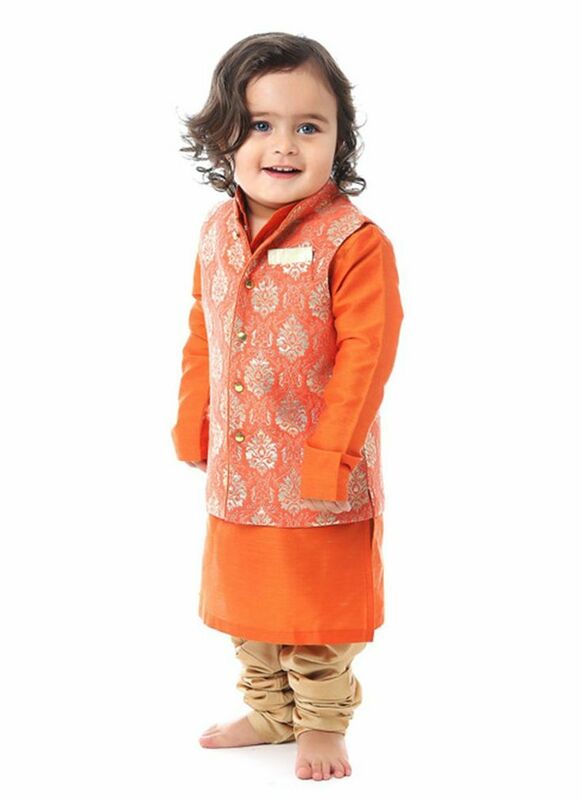 Nehru Jacket is one of the most hot selling items from our website which help your child gain a new avatar all together for that upcoming party or event. While opting for something so unique for your kid, you need to make sure that the whole attire is well synchronized that is, do not forget to add the right kind of footwear. Pick out for juttis or black indo western sandals which will complete the whole traditional look. These ethnic dresses are most demanded wears at the time of celebration of any traditional function, festival, cultural event, etc. So Cute Baby Kurta Pajama Dress. How can I Order It from Online? Wow So Cute baby in the way wear the clothes is also good best photo look it that pakistani suits. I Am Glad To Read Your Fashion Blog It's Too Informative For Me And Please Share More Blog Cause Your Blog Is Unique And I Like To Read And black and white Dress are absolutely nice. So Thank You So Much For Sharing Such Nice.